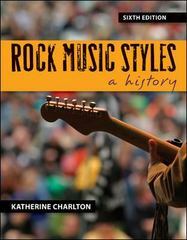 Rock Music Styles: A History 7 Edition In its seventh edition, Rock Music Styles: A History offers an updated perspective on the development of rock music from its origins to its most contemporary styles. Charlton takes students through genres by focusing on featured performers, exploring important songs in Listening Guides, and drawing connections between musical developments throughout the decades. Additionally, decade overviews and chronology charts detailing historical and rock-related events side by side provide a historical and social framework through which to understand rock music styles in the 20th century and beyond.